SP Studio Systems Collapsible EZ Softbox Octagonal 37"
The SP Systems E-Z Softbox is a snap to open and close. Set up a photo shoot quickly and easily. Just attach rear mount to your strobe, push in on the internal bracing arms, snap the umbrella-type lock into place and mount it onto your strobe head like a reflector. This 37" diameter EZ provides an omni-directional light, suitable for lighting an entire living room. Optional speed rings for most brands of strobes are available separately. No separate pieces to lose. Mounts to a strobe head like a reflector. Collapsible EZ Softbox Octagonal 37" is rated 4.8 out of 5 by 6. Rated 5 out of 5 by William Simpson from Fantastic Softbox I cannot say enough good things about this softbox! It is large, durable and an absolute pleasure to assemble. For anyone who has ever placed rods into a softbox and pressed and bent them in order to shape and lock the frame into place, you are in for a treat. 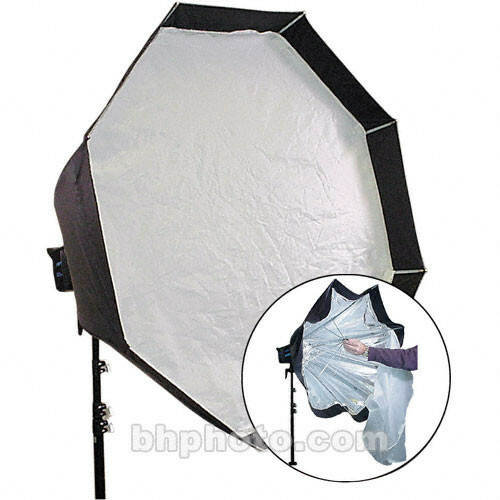 This softbox is built so that all you have to do is pull the frame (1 piece) out of its bag and then slide the central spokes onto a central column and assembly is complete. All you have to do is velco in the baffles. Asides from the easy assembly, this also diffuses light beautifully and evenly. It's a great softbox for portraits. Rated 4 out of 5 by Anonymous from Deceptive product photo I have two other SP Studio Systems soft boxes, the 24 square EZ and the not so EZ 36 square. I love the 24 use it all the time. The 36 puts out a very nice quality light but putting it together is time consuming. I purchased the 37 EZ Octagonal to get away from the assembly associated with the 36. So far, I find the light quality of the 37 is comparable to the 36. It sets up as advertised, easy. My two less then positive comments are: 1. The product photo make this unit appear to be shallow in depth, it is not. It measures 26 deep. It looks like a kettle drum hanging off of the strobe. 2. The depth and weight of the box have me concerned for the plastic strobe mount. It also tends to tip if you are not careful how you position it. Rated 5 out of 5 by Donald from Simple, Transportable, and Beautiful light As simple as advertised to set up and take down. The perfect softbox to carry along and shoot anywhere. You will have to purchase a speedring for your particular strobe. I have Profoto so I ordered the accessory speedring and it works great. The light is like any other 37 octobox but the ease of using this thing is brilliant. I know others make a similar product but not at this price. If you need an octobox and are considering a purchase, make sure you take a look at this. I set it up with both inner and outer diffuser panels then leave them mounted when I fold it up. Comes with a handy carry case that woks with the speedring attached. You can't go wrong with this purchase. Rated 5 out of 5 by Rivington from Superior Light Quality - Easy to Use I use this primarily for head and shoulders portraits. It is very easy to set up and produces nice soft light and an even catch light. Quality of light is as good or better than those costing 5 times the price. I use these on Alien Bees and have no problems with mounting - be sure to get the appropriate speed ring for your monolights. Rated 5 out of 5 by GL photographer from The product is very nice!! Easy to handle and works great with lghting kit. Rated 5 out of 5 by rootleaf from A pleasure to have on set! Like so many others who have dealt with speedrings and rods, I was extremely pleased to use this octa box. It opens like an umbrella and mounts in seconds (with the appropriate speedring). It has an internal baffle and a diffuser and produces soft light even light exactly where you want it.